Shed Ender is the revolutionary new professional de-shedding tool that's changing the way people groom their pets. 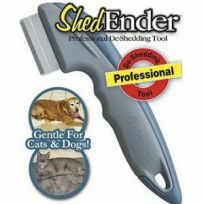 The specially designed Shed Ender uses the same technology as professional groomers to remove dead, shedding hair. You'll be amazed that so much hair was trapped in the undercoat, and that you won't have to clean it up later after The Shed Ender. Features: Quick & easy way to control shedding! As Seen On TV Removes shedding hair where other brushes fail! Keeps shedding hair off your pet and out of your house! Promotes a shiny coat and healthy skin. For long and short hair pets! Gentle for cats and dogs. For right and left hand use.